I am presently handling a case for a catastrophically injured cyclist. He unfortunately found himself underinsured because of language found in his auto policy. Like many of you, he bought motorcycle insurance from a company that was not the company that insured his automobiles. I am sure that he thought he was being very prudent in buying “supplemental” insurance. WARNING! He had a great auto policy but, probably, like most of you, he did not read the exclusion in the small print. His auto policy with high underinsured limits did not apply to a vehicle he owned which was not covered by his auto policy. Since he covered his motorcycle with another company, he was excluded from recovering his million dollars underinsured coverage under his auto policy. If his motorcycle had been insured in the policy covering his auto, the exclusion would not have applied. To make matters worse, his auto policy contained a provision excluding medical payments for injuries sustained while operating a motorcycle not insured by his auto carrier. Check your policies now. Whenever possible, cover your auto and motorcycle under the same policy. If you have questions please give me a call, as I don’t want to see anyone else in this position. If you have already been injured and have been faced with this exclusion, please give me a call. Some insurance companies have failed to write the exclusion properly and recovery may be possible. Notice regarding the St. Jude Recall. If you have one of these devices or know of anyone with one of these defective devices, please give our office a call immediately for a Free Consultation. To date, of the 398,740 affected devices sold worldwide, 841 were returned for analysis due to premature battery depletion caused by lithium clusters. 2 deaths (1 in the U.S.), have been associated with devices that could not provide needed shock therapy due to premature battery depletion. 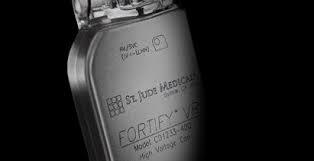 10 patients (9 in the U.S.), have reported fainting from devices that could not provide needed pacing therapy due to premature battery depletion. 37 patients (30 in the U.S.), have reported dizziness from devices that could not provide needed pacing therapy due to premature battery depletion. Last year, 253 people in Pennsylvania died under circumstances for which a medical professional may have been responsible. The state knows where these deaths happens — which hospitals, care homes and other medical facilities — but it doesn’t allow you to know. The agency tasked with keeping data on medical errors and related issues in the the state is the Pennsylvania Patient Safety Authority. It collects hundreds of thousands of reports a year from designated safety officers of medical facilities. Ninety-seven percent of the roughly 239,000 incidents recorded in 2015 were “near misses,” lapses in safety protocol that were noticed, but did not harm a patient. More than 7,700 reports recounted “serious events,” in which a patient was harmed. More than half of these cases were complications related to procedures, treatments and tests. Medication error, adverse drug reactions and patient falls, among other issues, made up the rest. If you want to find out how your local hospital fares on medical errors, the authority can’t help you. The law that created the agency mandates it keeps its reports under lock and key, beyond the reach of the usual ways journalists and lawyers obtain public records in Pennsylvania. The medical world is growing more aware of the magnitude of medical errors. A study published in The British Medical Journal in May estimated that medical errors are the third-leading cause of death in the United States, behind heart disease and cancer. Yet the agency charged with tracking them in Pennsylvania does its number crunching in the dark. The 2002 law creating the state’s Patient Safety Authority dictates that it only releases its data as statistics. The statute — the Medical Care Availability and Reduction of Error Act, referred to as the “MCare” law — shields incident reports from subpoena in lawsuits and the Right to Know law that enables Pennsylvanians to request many kinds of public records from the state. The names of doctors and others involved are also omitted from reports before they go to the authority. Did the state ever take corrective action over a “serious event?” That’s also confidential. Though the two agencies are separate, the Pennsylvania Department of Health reviews reports of infrastructure failures and serious events submitted to the Patient Safety Authority and looks for evidence a state or federal law was broken, according to a department spokesperson. If there is reason to suspect that’s the case, the department launches an investigation. As for how many they conduct per year, into whom, and what the results were, the public can’t know that either. “The statute does not permit the department to release information that makes clear when a report to the Patient Safety Authority has resulted in an investigation,” Holli Senior, a special assistant to the department’s secretary, wrote in an email to PublicSource. Heart disease is the culprit in one in every four deaths. Cancer took more than 591,000 lives in 2014. According to researchers at Johns Hopkins University, the next leading cause of death is medical errors. That would put medical error above respiratory diseases, accidents and diabetes. It’s an estimate because “medical error” is not a category on death certificates in the United States. The certificates are based on the International Classification of Diseases. That index was written before awareness of medical negligence as a major issue, according to Dr. Michael Daniel, co-author of the report. “Human error isn’t on there but getting run over by a cow is,” he notes. Like the authors of a report on error that shook the medical establishment in 1999, Daniel and Dr. Martin Makary used a synthesis of past reports to calculate the prevalence of medical error in the United States. Daniel and Makary’s 2016 report puts the fatality rate at 251,000 per year. When Dr. Rachel Levine took the position of state physician general in January 2015, becoming the chair of the Patient Safety Authority’s Board of Directors came with it. She stresses that autonomy is important to maintain the non-punitive, data-gathering role of the authority. A medical facility’s safety officer, usually a nurse, should feel comfortable reporting all the incidents he or she is mandated to report to the authority without thinking it could come back to harm his or her employer, Levine said. The authority standardized forms for facilities in April 2015 to improve consistency in reporting. The 253 deaths reported in 2015 represent a 22 percent increase in fatalities from 2014, when 208 deaths were reported as stemming from potential medical errors. The authority attributes the increase, in part, to the change in reporting. Like this story? Subscribe to our newsletter. Meanwhile, there are other, more transparent ways that the Department of Health maintains patient safety, said Wes Culp, deputy press secretary. He points to the hospital, nursing care facility and healthcare-associated infection reports available on its website. Also, licensing boards review the conduct of medical professionals. Regina Hoffman, executive director of the Patient Safety Authority, stresses the need for a “free flow of information.” She said information gathered by the authority has led to efforts to lessen patient falls and pressure ulcers, common problems that were revealed by the data. Hoffman said it’s crucial that safety officers don’t think they are building a bad reputation by noting lapses in protocol, the ones that don’t involve harm to a patient and make up the majority of reports the authority gets. “It’s very important they are not fearful of reporting,” she said. Making patient safety data and these reports publicly available isn’t the same as publishing restaurant health and safety violations cited by inspectors, Hoffman said. Medical providers self-report to the authority. If one hospital has more reports than another, it doesn’t necessarily mean the hospital is lax about patient safety, she said; it could mean the facility takes patient safety more seriously. Legislators in Pennsylvania began crafting an overhaul of the state’s medical safety and malpractice policies. A major facet of the MCare bill was the establishment of a fund that acted as a kind of state insurance program for people deemed in court to have been injured by medical negligence. It is financed by surcharges to healthcare providers. What providers are charged each year is based on assessment rates at the Joint Underwriting Association, an insurance industry group. If payments to harmed patients fall lower than expected, facilities get a refund. The creation of the MCare law “involved a legislative battle between proponents of more protections for patients against proponents of more protections for medical care providers,” attorney Clifford A. Rieders wrote in a 2005 article for the Pennsylvania Bar Association Quarterly. Gradually, the bill became softer on patient safety, Rieders concluded. Proposed regulations that would have benefitted patients, he wrote, were removed in legislative committees, including one that would have levied a penalty for altering or destroying medical records. As part of the overhaul, healthcare providers were required to report an array of incidents to the newly created Patient Safety Authority, which would use them to compile data and make recommendations that would decrease medical errors — and with that the fees to the MCare fund. 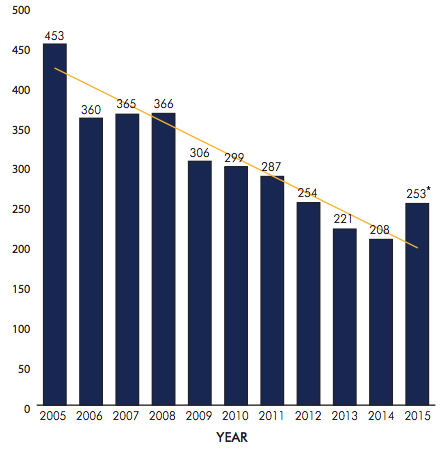 Deaths from medical error in Pennsylvania have declined from 453 in 2005 to 253 in 2015. Large healthcare systems also have internal protocols for reducing errors. *The 253 deaths reported in 2015 represent a 22 percent increase in fatalities from 2014. The Pennsylvania Patient Safety Authority attributes the increase, in part, to the change in reporting. Dr. Sam D. Reynolds, chief quality officer of Allegheny Health Network, said the conglomeration of hospitals and practices has its own data collection process. In addition to the state-mandated safety officer, each AHN facility has a quality director, and a network of committees and officers review safety data. UPMC’s chief quality officer, Tami Minnier, said all reports of errors or safety concerns at the network are tracked internally through a software program, and “anyone with a UPMC badge” can make a report. This includes custodians and cafeteria workers. “Sometimes they notice things no one else would,” Minnier said. A committee meets weekly to review the reports. Daniel, co-author of the recent study, said the issue is not that healthcare systems don’t care or that doctors are trying to hide mistakes. As the medical field expands and people interact with it more, more errors will happen. It’s one reason Daniel feels human error should be added as a category on death certificates; it would move the issue to the forefront of medical professionals’ minds and may lead to more safeguards to prevent common errors. Nick Keppler is a Pittsburgh-based freelance writer who has written for Mental Floss, Vice, Nerve and the Village Voice. Reach him at nickkeppler@yahoo.com.